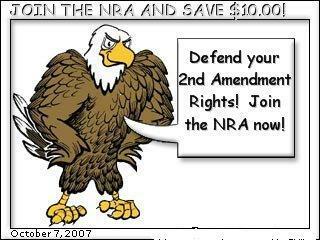 Link here to join or renew membership in the NRA - Save $10.00. We sincerely appreciate your business. As a token of our appreciation, we would like to offer you a discounted one-year membership to the National Rifle Association. Join or renew today and receive a $10.00 discount. These basic membership benefits are automatically included with your NRA Annual Membership or Life Membership, along with special members-only discounts and services. An official NRA Membership ID card - showing your Membership ID number and expiration date or Life Member status. You should carry this card with you at all times. 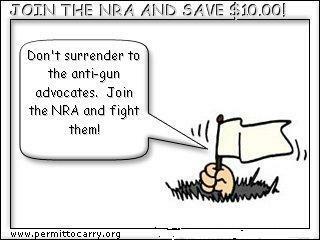 $1,000 of ArmsCare coverage with your NRA membership. This plan covers insured firearms, air guns, bows and arrows against theft, accidental loss, and damage. The most important benefit of NRA membership, however, is the defense of your Constitutional right to keep and bear arms. NRA-ILA tracks the issues and alerts members about legislation involving firearms and hunting at the federal, state and local levels of government. Successful legislative action begins with you -- the individual member. For information regarding legislative action or to become an ILA grassroots volunteer, call 1-800-392-8683.